Pentaho Analysis Services is called Mondrian, which is the name I’ll use for the remainder of this post. Mondrian is Pentaho’s OLAP server. In this post I’ll provide step-by-step instructions on how to install Mondrian 3.4.1 Ubuntu Linux 12.04 LTS x64. We’ll use MySQL as the database. Let’s first create a directory to download Mondrian into. To download the Mondrian either run the following command, or follow the 3 bulleted steps below. Or follow the steps below if you don’t want to use the wget command shown above. Download Mondrian 3.4.1 from http://wiki.pentaho.com/display/COM/Latest+Stable+Builds. Click mondrian-3.4.1.zip to download Mondrian. FoodMart is a sample database that can be used to learn Mondrian. Enter the following commands at the MySQL command prompt. Please use a real password by changing pass.word below. Change akbar to your user name in the inputFile option in the command below. If you get an error, there is a 99% probability that the jar files cannot be found on the paths specified in the command above. So, the first thing you should do is check if the jar files can be found in the class path paths that are listed above, then update the paths as necessary. Edit each of the following files and make the change shown in the From / To instructions below. <jp:mondrianQuery id="query01" jdbcDriver="org.apache.derby.jdbc.EmbeddedDriver" jdbcUrl="jdbc:derby:classpath:/foodmart" catalogUri="/WEB-INF/queries/FoodMart.xml"
I have changed the default Pentaho BI Server port from 8080 to 8585. Open a web browser to http://localhost:8585/mondrian. Click each of the links below to view the same cube. The cube will be populated for the first time when you click the first link below. In other words, the first page will take a long time to load while the cube is populating. On my system, I actually had to reboot and restart Tomcat before the pages displayed. Nothing needs to be done to setup the FoodMart database, however you will need to edit the following configuration files when you create your own database. I was initially using the instructions at http://mondrian.pentaho.com/documentation/installation.php, however, I got the following error when I ran the jar command. Could not find the main class: mondrian.test.loader.MondrianFoodMartLoader. Program will exit. There are many reasons for changing the Pentaho BI Server’s default port, but one of the most common is a conflict with another server. I ran into this issue where both the Pentaho User Console and the Hadoop MapReduce ShuffleHandler were trying to use port 8080. I wrote an earlier article on how to change the default port for Hadoop MapReduce ShuffleHandler. So this got me thinking about how to change the Pentaho BI Server port, which is the focus of this article. Plus, it’s always good to know which ports each server requires so that you can manage your firewall, security, and so on. Open a terminal and enter the commands below. We’ll make a copy of server.xml before we edit it. I like to keep an original copy of each configuration file that I edit. My standard is to append ‘.org’ to the end of the file. I’m going to change from port 8080 to port 8585. Also, I’m going to use sed so that I can change multiple settings with a single command. Next, we’ll have to update one of the comments that references port 8080. I like to keep my comments in sync with the configuration. Let’s check what we changed via sed. This command is a good use of the server.xml.org file that we created above. < <Connector URIEncoding="UTF-8" port="8585" protocol="HTTP/1.1"
> <Connector URIEncoding="UTF-8" port="8080" protocol="HTTP/1.1"
Open a web browser to http://localhost:8585. Click Evaluation Login and select a user type to login as. Sakila is an example database for MySQL. It is often used for training purposes. Run the following in a terminal. The steps below are performed within the PDI UI. 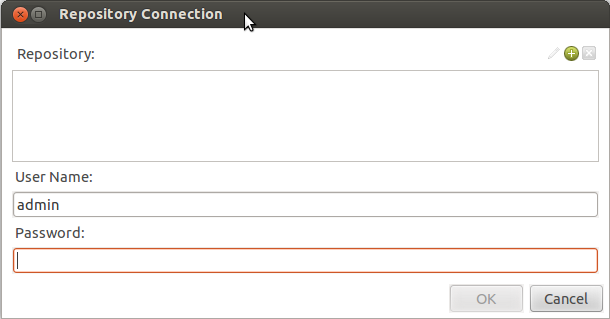 In the Repository Connection dialog box, click the small green plus symbol. 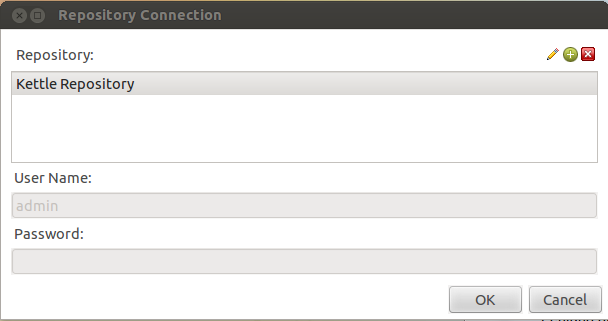 In the Select the repository type dialog box, select Kettle file repository. This is my personal .bash_aliases file that is mainly used for Cloudera CDH4 (Hadoop) and Pentaho. As a result, many of my aliases are specific to these software packages. I plan to update this post as my .bash_aliases file expands. I will also push my .bash_aliases file into Git to make it easier to keep up with changes to the file. Paste the following into the file. Kettle is Pentaho’s ETL tool, which is also called Pentaho Data Integration (PDI). Installing Kettle is extremely simple. To download the Kettle either run the following command, or follow the bulleted steps below. Open a web browser to http://wiki.pentaho.com/display/COM/Latest+Stable+Builds. There is a lot of good documentation installed with PDI. The instructions below assume that you’ve followed my prior blog posts on how to install Pentaho on Ubuntu Linux 12.04 LTS x64. To download the Pentaho Metadata Editor (PME) either run the following command, or follow the 3 bulleted steps below. Download Pentaho Metadata Editor (PME) 4.5.0 from http://wiki.pentaho.com/display/COM/Latest+Stable+Builds. Click pme-ce-4.5.0-stable.tar.gz to download PME. Pentaho Design Studio (PDS) is a BI plugin for Eclipse. I’m going to download the complete package as Pentaho was nice enough to integrate the plugin with Eclipse for us. To download the Pentaho Design Studio (PDS) either run the following command, or follow the bulleted steps below. Click pds-ce-linux-64-4.0.0-stable.tar.gz (assuming you are using 64 bit Ubuntu). I am going to assume that you have downloaded the file listed above into the Downloads directory in your Home directory. Near the bottom of the file you should see the PATH variable. Append :$HOME/bin/design-studio to end of the PATH. It’s better to append :$HOME/bin/design-studio to end of the PATH than the beginning so that we don’t accidentally step on another installation of Eclipse. Also, as we created a symlink named pds we are less likely to have PDS inaccessible due to another Eclipse installation that is earlier in the PATH. Next, we’ll create a symlink named pds so that we can type a shorter command to open Pentaho Design Studio. Finally, source your profile to update your environment. Pentaho is an open source Business Intelligence (BI) Suite that comes in with either commercial support (http://www.pentaho.com/) and or community support (http://community.pentaho.com/). This post provides instructions for the Pentaho community edition suite. Now that we have Java installed we can get on with our main task of installing the Pentaho BI Server. Download the Pentaho BI Server from http://wiki.pentaho.com/display/COM/Latest+Stable+Builds. I’m using the current stable build for x64 Linux which is biserver-ce-4.5.0-stable.tar.gz. The following command is only required if you downloaded a Windows .zip file by accident. If this is the case, then none of the .sh files will be executable. Open a web browser to http://localhost:8080. Open a web browser to http://localhost:8099. Enter a User Name of admin. Enter a Password of password. That’s it. The core Pentaho BI server is installed and ready for development. However, a good next step is to change the database that Pentaho uses and install the Pentaho Design Studio (PDS), but we’ll leave that for future posts. Hadoop also port 8080, so you will either need to use a different port for the Pentaho User Console or change the Hadoop MapReduce ShuffleHandler port. Your steps may vary slightly as I had an older version of the JDK installed. However, the gist is “just click Next till your done”. Download the Java JDK from http://www.oracle.com/technetwork/java/javase/downloads/index.html. Click Next. Wait for the installation to finish. Click Next. Wait for the JRE installation to finish. Click Next to start the JavaFX SDK Setup. Right-click on Computer, click Properties. In the left pane, click Advanced system settings. In System Variables, scroll till you find Path. Add the Java bin folder to your path by appending ;C:\Program Files\Java\jdk1.7.0_04\bin to the end of the Path Variable Value. As last step check that your path is set correctly. I had to reboot to get this to work. Download the Pentaho BI Server from http://wiki.pentaho.com/display/COM/Latest+Stable+Builds. I’m using the current stable build which is biserver-ce-4.5.0-stable.zip. Open Windows Explorer and create new folder: C:\Program Files\Pentaho. Next, copy the biserver-ce and administration-console folder into C:\Program Files\Pentaho. In Windows Explorer, navigate to C:\Program Files. Right-click the Pentaho folder, click Properties. Select the Security tab, click Edit. Enter the developer’s username, then click OK. In the Allow column, check Full control. Open Windows Explorer to C:\Program Files\Pentaho\biserver-ce. If the Windows Security Alert dialog box pops up, then click Allow access. I recommend that you resize the command window that displays the Tomcat messages. This will make it easier to read messages that are output by Tomcat. In the top left corner of the Window, click the Java icon. Open Windows Explorer to C:\Program Files\Pentaho\administration-console. That’s it. The core Pentaho BI server is installed and ready for development. However, a good next step is to change the database that Pentaho uses, but we’ll leave that for another post.